Recently, an anti-vaccine doctor from Oklahoma, Dr. Jim Meehan, wrote an online post about why he would no longer vaccinate his children. It’s pretty clear that his post is not so much a discussion of his own children (most of whom are adults) as an attempt to deter other parents from protecting their children from preventable diseases. His post is basically a set of claims trying to convince parents that vaccinating is very dangerous. The claims used to do so are nothing new: they are strictly out of the anti-vaccine playbook. But the post has received some attention in the anti-vaccine world, and was shared several thousand times, likely because many people treat an MD as an authority on the subject. So I decided to take a few minutes to explain why his claims are not good reasons to reject expert opinion and not protect children from disease. The diseases we vaccinate against are not dangerous, and it’s okay, even good, to encounter them naturally. Vaccines are dangerous to children. The science behind vaccines is corrupt because the pharmaceutical industry controls it and corrupts it. We should listen to him because he is a doctor and knows what he is talking about. Note: Dr. Meehan’s post doesn’t present these claims in that order. I have changed the order, because I want to address the claims in a logical order, that is, first his claims about vaccine safety, then the conspiracy theory that underlies them, and finally, his appeal to authority. Category 4 – Honestly, an imaginary global conspiracy does not negate science. Dr. Meehan implies there are benefits of children encountering diseases naturally, and this sentence appears to apply to all preventable diseases we vaccinate against. But it’s not clear what benefit a child gets from contracting diphtheria, polio, tetanus, whooping cough, or Haemophilus influenzae type b (Hib). Diphtheria has a 10% mortality, as does tetanus. Recovery from either would be, at best, hard and painful. Polio can paralyze or kill. As for the other diseases, they can, at least, cause substantial suffering. To remind Dr. Meehan, when vaccines prevent these diseases, they save tens of thousands of lives per year and prevent millions of hospitalizations (and see this review of an article that examines how many lives and sicknesses have been prevented by vaccines). Is it really a benefit to suffer from these diseases? I don’t know a lot of parents that would want that for their child. It looks like the treatment options available are limited for all of these diseases. Measles is the most severe of them. In the developing world, measles is a ferocious killer. In the developed world, it is less so, but it’s still not a mild disease. Over 10% of people with measles are hospitalized. One in a thousand has encephalitis, and (on average) about one in a thousand dies. I’m not sure what Dr. Meehan’s standard is for a dangerous disease. This isn’t a risk I would want for my children. Mumps and chickenpox’s complications are less common, but they do happen. And they are preventable by vaccination. Rarely, a person can have a severe allergic reaction to a vaccine, usually, though not always, to the gelatin in them. These reactions happen at a rate of about one per million. The premise is that vaccine ingredients are dangerous. But in the form and in the tiny amounts in vaccines, these ingredients are not dangerous. Vaccines use tiny amounts of aluminum salts to generate a stronger immune response (not elemental aluminum, as Dr. Meehan’s comment may lead you to believe) – but those amounts are easily dealt with by the body, and are dwarfed by the amount of aluminum we get from food (more information here and here). Moreover, there is also no real indication that the tiny amounts of polysorbate 80 in vaccines are dangerous. As to the tiny amounts of DNA that might end up in vaccines, as was pointed out before, if it was that easy for fragments of DNA to affect the human body, gene therapy would be much easier. It’s not. Finally, for those who would like to read more evidence-based information on why the toxin gambit is wrong, two of my favorite go-to sources are here and here (pdf). Note that Dr. Meehan’s first comment claims that children are “stolen” – echoing the claims made in old times of children being replaced by elves or witches. Those familiar with anti-vaccine terminology would realize he is referring to families who blame vaccines for a child’s autism. But vaccines don’t cause autism, as studies in millions of children show. Autism causation lies elsewhere. Further, it is an insult to autistic people to refer to them as “stolen”. The children are there. They are simply autistic. 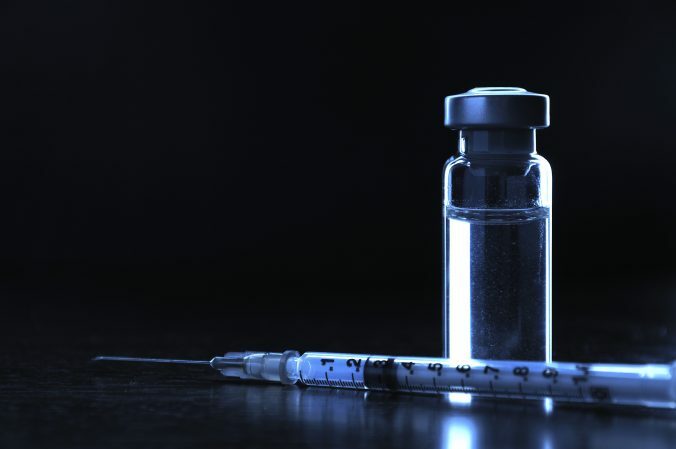 The reality is that while nothing in life is completely safe, and vaccines can have harmful side effects, serious harms from modern vaccines are extremely rare. It is the opposite of an assault on children to protect them from diseases that can maim and kill. Let me start by saying that I would not want to have to trust for-profit corporations to be upfront about vaccine safety, especially not when, as Dr. Meehan correctly points out, several of our pharmaceutical companies have engaged in problematic behavior in the past (though note: he had to step outside the vaccine realm for an example, because he is unable to point to a recent vaccine scandal with one of our companies – to my knowledge, there isn’t one). But I don’t need to trust. There are literally tens of thousands of safety studies about vaccines. They come from all around the world. They are funded by multiple sources, as looking at their funding statements can tell us: by pharmaceutical companies, but also by governments – different governments, including those with national health insurance systems and a strong incentive to cut costs, non-profits, universities. They are done, usually, by large, multi-members teams of researchers. And on each point related to vaccine safety, we usually have several studies that reaffirm each other. On top of that, governments all over the world monitor vaccine safety after they are administered. To believe all of that science in corrupt, you have to assume a degree of collusion and control that is simply fantastic. You have to assume that pharmaceutical companies can control or mislead thousands of researchers, and hundreds of thousands of doctors, and governments all over the world. Accepting such a global, far-reaching conspiracy requires ignoring basic realities about the ability to manage such a large-scale deception. It’s just impossible. This belief also doesn’t fit the reality of what happens when there is an actual problem with vaccine effectiveness or safety. When some H1N1 influenza vaccines in Europe caused a few cases of narcolepsy, it was front-page news. When some children were harmed in Australia because they were given a vaccine not appropriate for their age, it was front-page news. When evidence on the lack of effectiveness of pertussis vaccines came out, it was front-page news. When the flu vaccine was ineffective a few years ago, it was front-page news. In a well known example, when a newly approved rotavirus vaccine – Rotashield – was found to cause a serious side effect in about 1 in 10,000 children (and also here), the vaccine was pulled off the market – and the issue was front-page news. The next generation of rotavirus vaccines were then required to be tested in tens of thousands of children. These cases demonstrate that vaccine problems are anything but hidden. Belief in a grand conspiracy of silence and globally controlled science on vaccines is just unrealistic, and against the evidence. I left this issue till last because it’s more important to focus on the claims than on the person. But since Dr. Jim Meehan is drawing on his authority as a doctor, and using his position to call on people to trust him, it is worth addressing. Dr. Meehan was trained as an ophthalmologist, but is now working on other areas, with an apparent focus on creating electronic tools to handle health problems. He has no expertise or experience in any of the biomedical fields that are related to vaccine research – public health, pediatrics, infectious diseases, virology, microbiology, immunology, or epidemiology. He has no publications indexed in Pub Med and no publications are listed on his site. He has published nothing that shows he seriously engaged with the extensive literature on vaccines. That may not disqualify him from criticizing a specific scientific article, but it also does not qualify him to counter the scientific consensus of those who are familiar with the literature and do understand infectious diseases and vaccines. 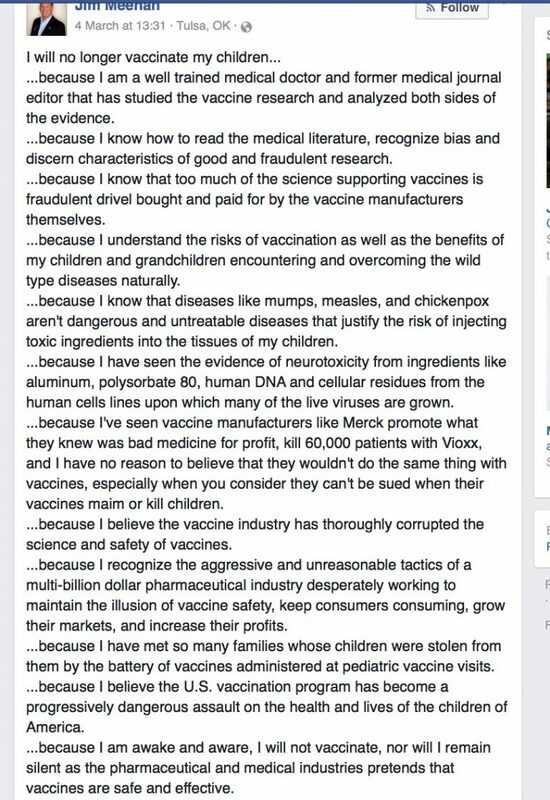 In fact, his comments show that he rejects most of the science develop by those experts in fields related to vaccines. Dr. Jim Meehan does have medical training, though it is not related to vaccines. He has no demonstrated expertise relevant to vaccines. His comments repeat well-familiar – and incorrect – anti-vaccine tropes. It is more troubling that a medical doctor is willing to make such claims than it is when a lay person does that. It seems like a misuse of the authority his medical training confers on him.